There are some facts you need to know that aren’t being exposed by the mainline media. The areas in these cities where these riots are occurring are economically challenged. The people are poor who live there. There is little productivity in the lives of people who live there. Gangs are often present and crime is high. I propose the reason for these riots is not because of any race war but because of the social-economic condition of those areas. When people have very little incentive to get ahead, they seek other things to fill up their time and, unfortunately, because they are poor, many use crime to meet their needs. Were you aware that the cities where these things are happening are under the control of the far left liberals? That should speak volumes. Liberal policies do not work and only lead to more problems. The evidence is overwhelming on this point. Anyone who doubts this needs to take an honest look at California and what’s going on there. They have so many problems in that state I cannot even list them all here. My purpose in this post is two-fold. First, I want to demonstrate we have huge cultural problems in the United States right now. That should be obvious without me saying any more than I already have. Secondly, I want to discuss the only way out of it. Yes, there are solutions if we are willing to pursue them, but all true solutions start and end with God, the Father of our Lord Jesus Christ. Jesus Christ did what was necessary to accomplish the redemption of not only mankind but the entire world. He is the one who is returning to straighten things out permanently. In the meantime we have governments established for the purpose of enforcing good and prosecuting evil int his world. It’s the government, then, that’s not doing its job when things go wrong as they clearly are throughout our nation. Isaiah 43:18-20 Do not call to mind the former things, Or ponder things of the past. “Behold, I will do something new, Now it will spring forth; Will you not be aware of it? I will even make a roadway in the wilderness, Rivers in the desert. Now that’s the heart of God for His people. Let me show you what God and our Lord Jesus Christ are going to absolutely do without man being able to interfere. 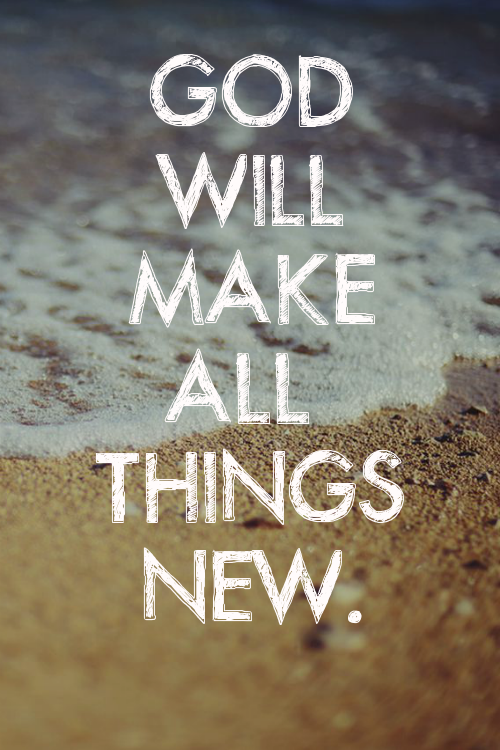 God has promised He will “…make everything new.” What a wonderful promise! In fact things will be so wonderful that we will not even remember the ‘former’ things that we’re going through now in this dark, evil world. Now those are wonderful promises to look forward to, but I have news for you! For we who have confessed Jesus is Lord, He’s already done something new. There you go. We are God’s new creation in this world right now. It’s up to us to shine forth the light of God’s Word and share the power of His love with others in this dying world. If you want to change the world, it starts with you and it starts within you. Having been born again of incorruptible seed by the Word of God which lives and abides forever, you are in the position to make positive changes in this world. Throwing temper tantrums when bad things happen doesn’t change a thing. Taking advantage of a peaceful protest to set cars and stores on fire and to steal booty is only adding to the problem. Justice works differently than this. That’s my admonition to you today. Answer evil with good. See what it does. Remember what Proverbs says, “A soft answer turns away wrath.” God’s Word is full of information on how to overcome evil and I’ve mentioned only a couple of verses. Dig into God’s Word yourself and discover how God wants you to handle the evil in your sphere of influence. Be part of the solution and not part of the problem. Change yourself and change culture. We learned that the first stage of Christian growth provides the foundation for our entire new life in Christ. That’s the “walk in love.” When we walk in love as Christ loved us and gave himself for us, we provide selfless service to others in the Christian church and to those God has called to become His children. Love is the basis upon which all our actions proceed. As we walk in love, God is able to enlighten us, hence, the second stage of Christian growth is to, “walk in light” as Christ is the light. God gives us the information we need as we live our lives and minister to others. Our understanding becomes enlightened in what Christ has done for us and what he is doing now. God’s Word becomes clearer to us and ore relevant in our daily lives. God provides light so we don’t stumble in the darkness of this world. The culmination of walking in love and walking in light is called “the circumspect walk.” We are exhorted to walk circumspectly, but what exactly does that mean? Let’s find out. Here’s the definition of circumspect. Circumspect means to walk with a fine-tuned degree of accuracy. It means to be exact and to not take undo risks. It’s walking with the wisdom of God in this world, having the knowledge of God ingrained in our lifestyles and walking by the spirit. This is the circumspect walk. The opposite is walking in worldly wisdom and philosophy which exalts itself against the knowledge of God. That’s the path we don’t want to walk in. Walking circumspectly should be the goal of every Christian. It’s great as a babe in Christ to learn God’s Word and adjust our world view and our actions to agree with what God wants. The emphasis in this early stage of Christian growth is to start leading a life that is pleasing to God, putting God first and loving God’s people. But that’s just a start. Too bad so many Christians never get past this stage to walk in light. Living the truth brings more light because we find ourselves in fellowship with God who is the light and He is able to work more intimately with us. The more truth you live, the more you will receive. Walking in love and walking in light seems to cover everything, but God adds one more stage of Christian growth to set our sights on, and that is to walk circumspectly. He wants to get so enlightened that we know exactly what to do in every situation. This is the walk of wisdom, having not only the accurate knowledge of God but also having the wisdom to apply it in every situation. I heard a story that describes the circumspect walk precisely. There is a certain mountain deer that leads her children up the mountainside. The baby deer follow right behind, putting their feet exactly where their mother’s feet were because they know the ground is solid there. The babies follow the same footsteps of their mother. This is a great example of the circumspect walk. The circumspect walk is watching our Lord’s footsteps and walking right in them. It’s the walk of the wise and God tells us in Ephesians 5 that we are not only able to walk this way, but that God expects it of us as we grow in Him. 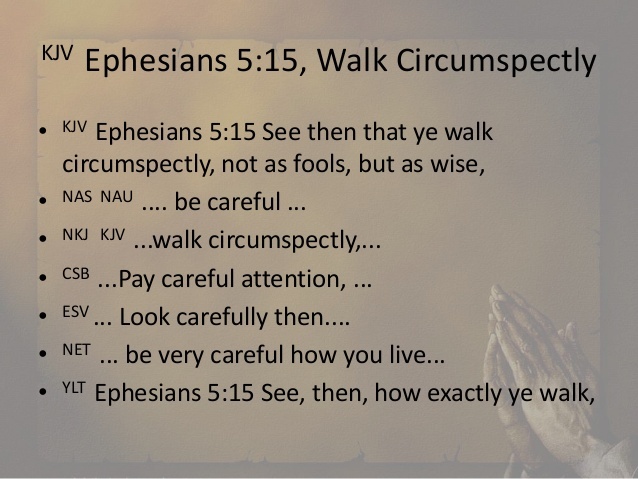 Do you walk circumspectly? Do you want to? Then grow in the knowledge of our Lord Jesus Christ. Walk in love, walk in light and mature into walking circumspectly. You’ll find yourself walking closer with God, hearing His voice more clearly and more often, and you’ll become much more useful to the Master, our Lord Jesus Christ. Enjoy walking with our Lord. There are at least three times as many Christians in the world as there are Muslims. In the United States alone, some 80% of the population claims they are Christian. With such a large majority of people claiming to be Christian, how is it that non-Christian beliefs and practices are rising to supremacy? And how is it that Islam is making such a prominent influence on our culture? The answer is clear. It’s because a large majority of Christians simply don’t practice the Christian faith. This is called, “Nominal” Christianity. When Christians are not vocal and active about what they stand for, it gives the enemy room to infiltrate and eventually dominate. 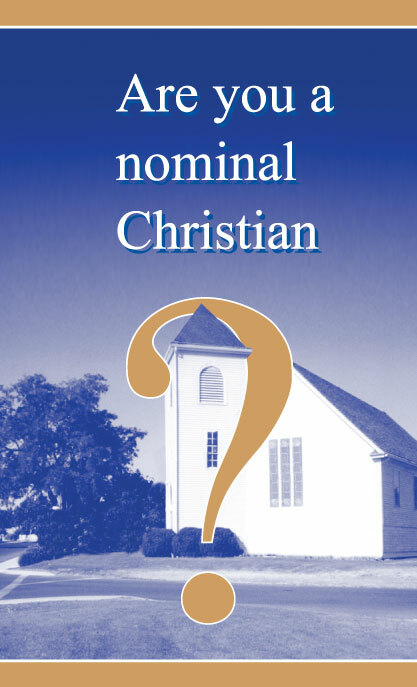 Nominal Christians are those who are Christian “in name only.” It’s easy to become a Christian — all you have to do is respond to God’s invitation by confessing the risen Jesus is Lord (Romans 10:9), but that is just the start of the Christian walk, not the end objective. Confessing Jesus is Lord is the beginning of a person’s walk with God Almighty and the Lord Jesus Christ. But how much spiritual “walking” is going on? My purpose in this post is not to condemn but to stir. It’s not to lay blame but to encourage Christians to stand for what they believe in. How vocal are you with what the Bible tells you is good and acceptable to the Lord? How willing are you to suffer reproach, to be different, to stand out in this world? I compare radical Islam to nominal Christianity to show the extreme contrast. With just perhaps a few percent of the Muslim population firmly committed to their founder’s message, look at how much influence they are having in this world! Whether you believe the radical portion of Islam is following the Koran’s teachings or not, they think they are and look at the effect they are having. I’m not in any way suggesting Christians get militant — please don’t. Our struggle is not against flesh and bone but against spiritual forces in the spiritual realm. Our weapons are not physical, they are spiritual. Prayer, faith, our God-given righteousness and salvation and the Word of God are our powerful weapons. With your mouth you speak what is in your heart and God takes no pleasure in those who let cowardice overcome their love for God and fellow man. II Timothy 1:7 For God has not given us the spirit of fear; but of power, and of love, and of a sound mind. The word “fear” in this verse is better translated, “timidity.” Spiritual power, love and a sound mind overcomes timidity or cowardice. We need not fear man or what man will do unto us because we are the Lord’s. We have major societal issues that confront us. Rather than sitting back and watching what happens, we need to help steer what happens. Watching does nothing but allow evil to prevail. Getting vocal puts you on the spot, but no more than it did Jesus. They crucified him, and he flatly asked why should we expect anything different. Staying safe in your own comfort zone is not the way to change culture. A philosophy of Christianity being “personal” rejects the Word of God which calls us to an active walk of faith as we represent Jesus Christ in this world as we live our daily lives. I ask you to get out of your comfort zone and start living for your living Lord Jesus Christ. If you are already, praise God, He has raised up another one who is responding lovingly to His call. Rather than watch things happen, help make things happen. Stand against the atrocities you see happening in our country and world. Stand for the truth and be willing to give your all — even unto death — for your Lord Jesus Christ. When he returns, he “has his reward with him” to give to those who serve him wholeheartedly and who do not hide their light under a bushel. Matthew 5:14-16 You are the light of the world. A town built on a hill cannot be hidden. YOU ARE THE LIGHT OF THE WORLD — SHINE BRIGHTLY! That’s my admonition to you. If we had 10% of those who claim they are Christian really stand on God’s Word and get vocal in their own spheres of influence, we’d see a massive change for God in our culture. Imagine what 20% could do? Get shining, lights of this world! Get the bushel off and let people see your light. They crave it, they just don’t know it yet. And don’t worry about those who hate it. When you shine brightly, your Lord loves it and that is all that matters. I Belong to Jesus — Forget the World! I belong to Jesus — do you? There is nothing in this world that attracts me more than Jesus. There is nothing in this world that promises more. There is nothing in this world that I want but to be in close communion with the Savior of the World, Jesus Christ. Forget the world and enter into the spiritual reality of life by acknowledging Jesus’ Lordship. Do you realize this world is passing away and only that which is eternal shall remain? I John 2:17 The world and its desires pass away, but whoever does the will of God lives forever. I Timothy 2:4,5 Who will have all men to be saved, and to come unto the knowledge of the truth. Confess Jesus is Lord and believe God raised him from the dead and you shall be saved! It’s simple because Jesus did it all for you. You can’t do anything on your own to “please” God because you were born faulty. That’s right, you were born faulty. Whose fault was that? Adam. Adam is the original man who counted the Word of God as naught and did his own will. That thrust mankind, for we all descend from Adam, into a fallen state — without God and without hope in this world. But God had a solution before he even made man. He foreknew what Adam’s decision and action would be. He knew in advance that Adam would not obey him, and he also knew who would. God planned to have a son of His own who would do His will. His name is Jesus. Jesus was born sinless and chose to obey God his entire life. Wicked men took him and crucified him but God raised him from the dead and made him Lord over all. When you realize God raised Jesus from the dead and that God has fore-ordained that he, Jesus, is the one He has chosen to rule all nations, what other choice would you make but to confess Jesus is Lord and accept his Lordship? He gave his life so you could live. As I hear the daily news about terror attacks, climate change, positioning of nations, political and societal corruption, it’s hard not to get depressed. It’s hard to look at what’s going around and see how ignorant the majority of people are about why these things are happening as they bash the Bible and Christianity. But I look beyond. I look into God’s Word and see what He has planned for those who love Him, who are called according to His purpose. Romans 8:28,29 And we know that in all things God works for the good of those who love him, who have been called according to his purpose. I want more brothers and sisters to join me on this journey into eternity. Are you one of them? Are you my spiritual brother or sister? Would you like to be? Confess Jesus is Lord and believe God raised him from the dead. Forget the world — it has nothing for you in terms of God’s riches. It has nothing for you in terms of eternity. But life in Christ is eternal, is rich, and is everything you really want deep inside. Lose yourself and find Jesus. He will be everything to you too. In Jesus, you absolutely cannot lose! 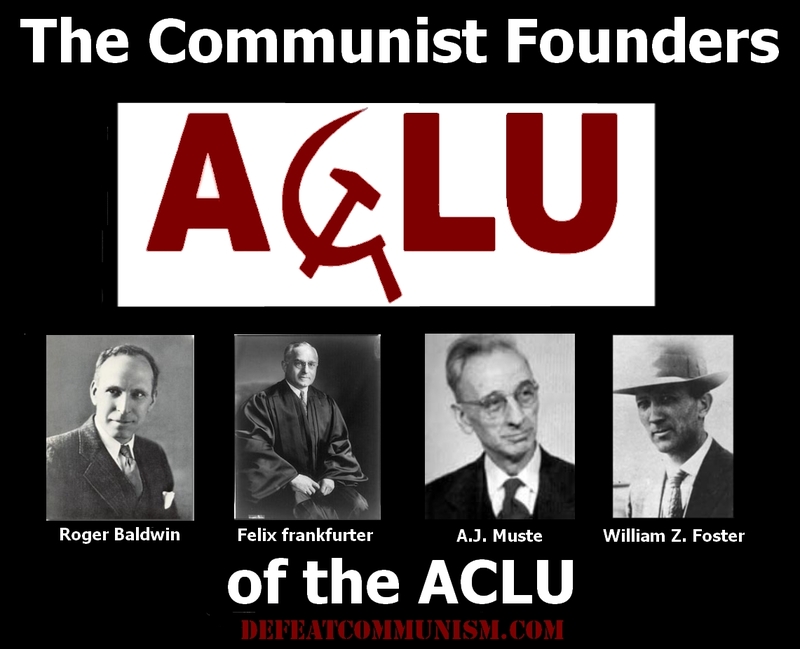 The wonderful ACLU, supposed progenitors of civil liberties, is suing the Catholic Church to try to force them to provide abortion funds for illegal immigrants. I speak tongue-in-cheek as suppressing constitutional religious rights is exactly the opposite of civil liberty. They are a confused bunch, bent on destroying the very religious foundation of our nation in my estimation. There are two issues I see in this fight. The first is in regards to the Catholic Church accepting some 60 million U.S. government dollars to help illegal immigrants, and the second is about religious liberty and whether accepting government money trumps religious rights of an organization. Jesus said, “I will build my church.” He doesn’t need government money to do it. It’s sheer stupidity to accept money from the government if you are a Christian church because then you subject your program to secular rules and laws. Separation of church and state is a good idea because it leaves the church to do what God wants with much less government intervention. Separation of church and state doesn’t eliminate the right for Christians to enter the political arena and work to change things, but it does protect the church from being forced to do things against its core belief systems. The Catholic Church, in my estimation, should return those funds and supply their own. They are the richest church on earth with vast financial reserves. They don’t even need government money to do a project such as this. Their numbers are so large that all they have to do is issue a request and they’d have more than 60 million to fund the project. Their acceptance of government money to do this work is nonsensical and borders on greed. Isn’t it more blessed to give than receive? The second part of my argument is that the government knows well the position of the Catholic Church — and most Christians — on the issue of abortion when they signed the deal. Because of this, there is no way the ACLU or anyone else should be able to sue the Catholic Church to fund abortions contrary to their belief system. It’s a direct infringement on religious liberty and the very commission given to the church by Jesus Christ to carry out work according to the written Word of God. To the ACLU I have this to say: Beware lest you find yourself fighting against God. It’s not wise to become an enemy of the Creator of heaven and earth. There is another aspect to this also. These immigrants are here illegally. They knew the risk of leaving their home countries and illegally entering the United States. Why should American tax dollars fund anything related to them? Now before you accuse me of hating immigrants, let me clarify my position. America was formed by immigrants. My parents’ parents were immigrants. I love all people whether they are immigrants or not. But I do not support illegal immigration. Illegal is the key word here. In my estimation, the Catholic Church should never have accepted government money for this work. Had they done this out of their own coffers, what an example of Christian giving that would have been. Instead their actions have turned this into fertile ground for another lawsuit attacking religious freedom. We don’t need any more of those. The government-run courts don’t always decide in the interest of religion even though our Constitution of the United States demands. it. Pray with me that Christian Churches will stop accepting government money and, figuratively speaking, stop sleeping with the devil. Christians are encouraged to grow up spiritually, leaving the things of this world for the weightier and permanent things of God. Christian growth is a high priority for those who want to serve our Lord effectively and live a life pleasing to him. Just about every Christian will say that to live a life pleasing to God and our Lord Jesus Christ, don’t sin. Is that it? Is that the fulcrum of the Christian walk — to perfect our walk so we do not sin? Certainly our Lord wants us to “sin no more” as he told the prostitute whom he forgave but is that it? No, my friend that isn’t ‘it.’ That is just the beginning. The foundation of the Christian walk is to live without sinning alright, but it’s more than that. We began this three-part series with the walk in love (if you haven’t read it I encourage you to do so here: http://christianculturecenter.com/christian-grow…1-walk-in-love/). Today we’ll discuss the second stage, which is to walk in light. In the first part of Ephesians 5 we read about this opening phase of the Christian lifestyle. I’ll repeat those verses here for your convenience. The word “sin” literally means “to miss the mark” most of the times it’s used. There are other words for sin but the principle word used describes someone trying to hit a target that they miss. In contrast to walking in love, the apostle Paul lists several things that indicate someone is not walking in love such as fornication (which is widespread in our day and age) and covetousness (which is just as widespread) . These things evidence “sin” which means we are missing the mark of the high calling of God in Christ Jesus which God has set before us. There is a tremendous amount of information in these few verses, so let’s dig deeper and see what God is telling us here. First, God reminds us that we were once living in darkness. We were not illuminated by the truth and walked as we pleased, as much as we could, in this world. Because we are now “light n the Lord”, we are commanded to walk as children of light. This walk in light is natural for a child of light. But what is light? Light represents God in the Bible while darkness represents evil. The entire universe is set up to display this truth. We have bright balls of gas that shine light to their circling planets. God marked the light for day and the darkness for the night. He made our physical eyes so they need light to see. Without light, you can’t see a thing and in the apocalypse to come, there will be a period where the darkness is so dark people will be able to “feel” it. God is going to show them how dark they really are who reject His son and those he sends to them. Fruit of the spirit is connected to walking in light. Let’s see what this fruit of the spirit is. Galatians 5:1,2 This I say then, Walk in the Spirit, and ye shall not fulfil the lust of the flesh. Notice I went to the context of the verses on the fruit of the spirit to see a fuller picture. Verses need to be understood in the context in which they appear, not independent of it. Clearly, “walking in the spirit” is what produces “fruit of the spirit.” Walking in the spirit is the equivalent of walking in light. By using the word “spirit,” the literal is presented, while using the term “light” is a figure of speech pointing to God who is Spirit (John 4:24). What are some of the things that are different about walking in the spirit (walking in the light)? Wow. We can prove what is acceptable to the Lord? Really? How do we do that? That would require the mind of Christ. Yet the apostle says we have the mind of Christ! (I Corinthians 2:16). Again I have to say, “Really?” How on earth do we already have “the mind of Christ. ?” Hmm… have you figured it out yet? The answer is quite easy really. Romans, Corinthians I and II, Galatians, Ephesians, Philippians, Colossians and Thessalonians I and II are called “the church epistles” because they are addressed to Christians in our day and time (since Pentecost and before the return of our Lord Jesus Christ). Paul says in Galatians 1:11 that he received the truth contained therein directly from Jesus Christ by revelation. Hence, these seven church epistles (9 of course with II Corinthians and II Thessalonians) contain everything we need to live in this Grace period in which we live. You are able to prove God’s will (that which is acceptable to Him) by learning His Word. Study those seven church epistles until you know them inside and out. That is your light from Christ himself while the holy spirit within you is your light from within. When the inside matches the outside (the mind) you’ll have light to the proportion of how well you know and live what’s contained in those church epistles. This article is a little harder to read and understand than previous articles perhaps because of the many verses I’ve referenced, so if you’re having trouble understanding this, please re-read it with your Bible open so you can see it for yourself. To walk in light is to walk by the spirit of God. It’s the second stage of Christian growth which begins with walking in the love of Christ, but walking in love doesn’t step and transition into walking in light. You continue to walk in love as you begin to walk in the light. This is a growth — there is a building effect going on here. Love grows into light. The more you love, the more light you will have. Notice that walking in love dealt with not fornicating, coveting, etc. Those are personal sins that stem from the corrupt heart of man. But now we see Paul addressing external motivations — peer pressure, groups, other people and organizations. We see that our associations are important. We are not to involve ourselves with “works of darkness done in secret.” This brings to mind secret societies, whispering behind the scenes what one is really planning and then publicly saying something else. It reminds me of people who get together for the sheer pleasure of darkness, whether it be lust, greed, or whatever. People who walk in light not only avoid these things, but they reprove them. Now that’s putting yourself out there. Reproving darkness is to confront it with the truth. In some situations this could cost you your present life. But have no fear because your Lord is here! He is able to save you, and if he doesn’t then know that he will raise you up and everything will be OK in the end, and for all eternity. Walking in light is the natural outgrowth of walking in love. You love so you stand for our Lord Jesus Christ and walk as he walked — in the light of God’s revealed Word, proving what is that good and acceptable and perfect will of God (Romans 12:1,2) and reproving darkness wherever you see it. Yes, you will stand out. Yes you will often suffer in some way, even if it’s just strange looks from people. But it is doing what your Lord wants you to do. We are exhorted to “wake up” spiritually and Christ will give us light. I encourage you to wake up and live as Christ wants you to live — not just ‘not sinning’ but representing him in this world, standing for truth while reproving darkness. In the final part of this series on Christian growth, we’ll discuss how to take this walk in love to a fine degree of accuracy to increase the fruit we produce. Stay tuned to the Lord. Walk in love and walk in light. Grow! Jesus is still risen today and we’ve passed “Easter” day. As Christians we know this, don’t we? Then why do so many celebrate his resurrection as it if was some kind of sports game? To many, the celebration of Jesus’ resurrection takes back seat to his death. They cheer his resurrection on Easter as if it was a football game their favorite quarterback won, but within a few days (usually one day), the cheering is over and it’s back to the daily grind of living life and making ends meet. Is that what the resurrection is all about? A “memorial moment?” A “nostalgic moment?”A game someone won in past history? If you view Jesus’ resurrection as a nostalgic event that happened many years ago that we just “commemorate” on Easter, this article is for you. I want you to know, without any doubt, that Jesus’ resurrection was the biggest moment in human history that no future event will even shadow. Not even his glorious return is of the same magnitude as his own resurrection because without his resurrection, there would be no return int the first place. I want you to see what his death and resurrection accomplished for you should you choose to accept it by simple belief. I don’t know about you, but when I think of big events in human history, I think in terms of effect. What did the event accomplish? How did the event shape the direction the world was going in? When 911 happened, it changed the course of world history. That one massively bloody event had an effect on the world. That was a big event, but nothing like the resurrection of Jesus. Jesus’ resurrection changed history for good — literally for good. The world will never be the same because of it. With the death of Jesus Christ we have the propitiation of all mankind’s sins. Jesus’ death paid in full the debt of all just penalties and all the Creator God’s requirements for the redemption of the human race and the salvation of the world. Yes, that’s how big it was and that’s how big it is. That one act of selflessness during which Jesus voluntarily succumbed to the evil forces in this world on behalf of everyone, and laid down his life so we could live, not facing the judgement and sentence we deserve, but to receive the gift of immortality and entrance into God’s holy presence forevermore. Let’s see from God’s Word what Jesus’ death and resurrection accomplished on behalf of all who accept it by believing and confessing Jesus is truly Lord. The book of Romans states our legal position in Christ due to the sacrifice of Jesus on the cross and his subsequent resurrection. “Propitiation” means “payment in full.” We see in this verse we have “the remission of sins that are past” accomplished for us through Jesus’ death (the shedding of his blood which describes his death on the cross). We also see God justifies those who believe Jesus is Lord. Matthew 26:8 for this is My blood of the covenant, which is poured out for many for forgiveness of sins. Colossians 1:19, 20 For it was the Father’s good pleasure for all the fullness to dwell in Him, and through Him to reconcile all things to Himself, having made peace through the blood of His cross; through Him, I say, whether things on earth or things in heaven. Jesus’ death on the cross provided for forgiveness of our sins and our justification in the sight of God, both of these things combining to reconcile us to God. We have peace with God because of Jesus’ death and resurrection. Most people are aware of this, whether they believe it or not, because it’s been published throughout the world ever since the printing press was invented. But that’s not all of what Jesus’ death and resurrection accomplished. 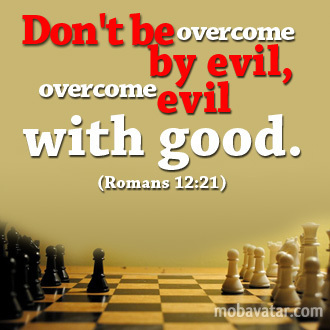 Peace with God means God will never, ever, condemn you or act in wrath toward you. Peace with God means he is no longer angry at you because of anything you’ve ever done — or ever will do. You had no choice coming into this world. You were born “without God and without hope in this world” (Ephesians 2:12). That was Adam’s fault way back in the garden of Eden 6000 some years ago. You didn’t have anything to say about these things, so why would God require or even expect you to do anything to get yourself out of that situation? This, my friend, is why salvation is free. It cost God His only begotten son, but to you and me it is free. Romans 10:9-11 That if thou shalt confess with thy mouth the Lord Jesus, and shalt believe in thine heart that God hath raised him from the dead, thou shalt be saved. Many people don’t realize that the resurrection of Jesus produced a new race of people. Jesus is the first “spiritual man” ever. He was raised with a new spiritual body, also promised to Christians (we’ll see this in a minute). He is called the “firstfruits” and the “firstborn” of all creation. This is a very interesting term which we’ll look at, but first let’s see it in Scripture. 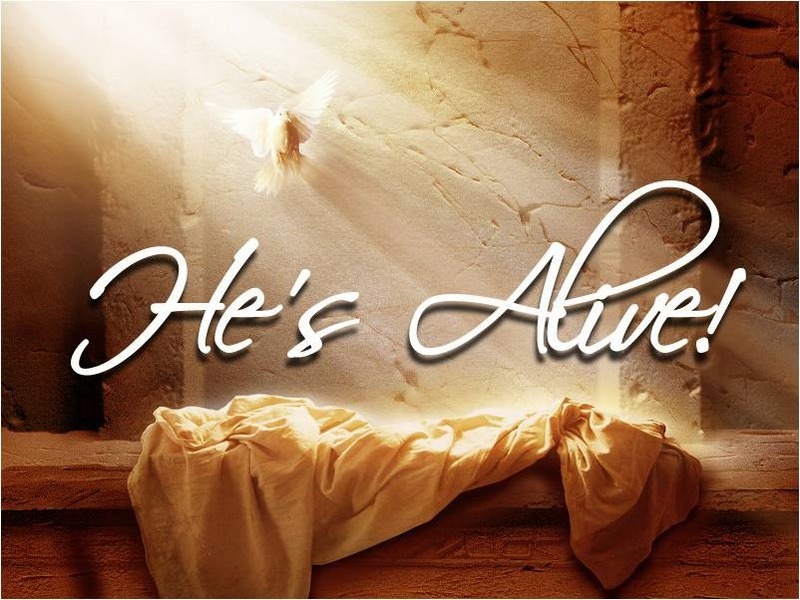 I Corinthians 15:20 But Christ has indeed been raised from the dead, the firstfruits of those who have fallen asleep. Romans 8:29 because those whom God foreknew he also predestined to be conformed to the image of his Son, that his Son would be the firstborn among many brothers and sisters. Colossians 1:18 He is the head of the body, the church, as well as the beginning, the firstborn from among the dead so that he himself may become first in all things. What is God telling us here? God is saying that Jesus is the first of a new race of people — the firstborn ‘over’ all creation. See the article linked above to go through this verse with a fine-toothed comb to see the reality of what this is talking about. Jesus is the first of a new race of people who, with and in him, inherit all of what God is giving. This is truly amazing. To confirm we are a new race of people in Christ, God tells us He has given us citizenship in heaven. This is spiritual citizenship. We have a heavenly, celestial destination, not an earthly one. Our true citizenship is in heaven, not in any country on this earth. Israel inherits earth but we are of that new race of people of whom Jesus is the firstborn, who inherit a new spiritual body as a new race of people. I encourage you to discover exactly what Jesus accomplished for us by reading and studying God’s Word. In God’s tremendous plan of redemption, His goal was to have children — spiritual children — to fellowship with. He wanted spiritual offspring who would worship Him in spirit and in truth. This is what He obtained in giving Jesus, His only begotten son, to the world. Praise God for his wisdom, love and might. When Jesus, who is still alive, returns, we who believe will be transformed. We’ll receive the same type of body Jesus has and we will have a new place in God’s order. This is the most fantastic hope anyone could have. Father thank you for giving your son for my sins. Thank you for raising Jesus from the dead. I believe Jesus is Lord. Thank you Father. 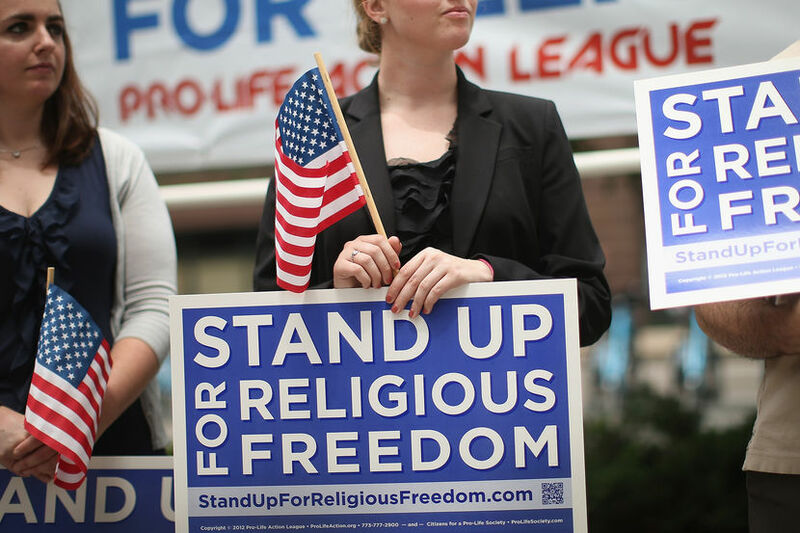 Why are Religious Freedom Restoration Acts Being Attacked by Americans? The United States of America used to be a place that defended religious freedom at all costs. That is why our country was founded. Thousands of decent people lost their lives defending our right to worship God as we see fit. The preamble of our Constitution of the United States declares we have unalienable rights to life, liberty and the pursuit of happiness, and our government is founded on the principle of life, liberty and justice for all. So why are there so many complaints — and threats — coming forth from Americans about Indiana’s and Arkansas’ new Religion Freedom Restoration Acts? Are not these laws simply upholding what our Constitution already says? To me they seem redundant but I understand why they are being passed. It’s due to unprecedented assaults on religious liberty that they are needed to remind people and enforce what our Constitution already guarantees us. You may have a better answer than I do, and please use the comments to suggest them, but my take is that we have fallen so far from the standard of righteousness in this country that unrighteousness is now prevailing. If I am correct, and this pattern isn’t corrected quickly, we are on the slipperiest road to our own nation’s demise. II say this with great fear for our nation as a whole and for the safety of Christians living here. Am I overreacting? Please let me know. Although not one word in any of the laws passed by 19 states and the Federal government even mention the word ‘gay,’ the biggest outcry is from the gay community. Are gays not concerned about religious freedom in America? Many gas are religious. It seems to me they are concerned solely about their own persecution and have no interest in defending the rights of others. We have heads of companies, including Apple and Walmart, decrying these new laws while those same companies do business daily in countries where gays are murdered just for being gay. Where is their outcry against those countries? Why are they not threatening to leave those countries if they don’t change their policies? This is a grievous contradiction with a name: hypocrisy. While they are trying to water down our own constitution, they are doing nothing about standing against human rights crimes in these other countries where they make a profit. The fear generated by these religious freedom laws has no ground for fact. Should a case arise where someone claims their religious freedom was violated, the courts will have to decide whether that claim is true or not. There are plenty of other laws on the books to prevent discrimination against, for example, gays. Just because the religious freedom laws don’t spell out that gays should be protected, they feel they won’t be. That fear is unjustified in my opinion. Those who would gladly repeal religious liberty are in grave danger of losing their own liberty. The erosion of human rights begins slowly and then escalates until government has totalitarian control or chaos ensues. This is the story of history my friend. There is no way around it. In this world, things start to decay and then they rot very quickly. Little can be done once the process starts. Regardless of whether you are gay or not, Christian or not, Muslim or not — if you are an American, you need to fight for religious freedom because it is the foundation of human rights in our country. Once that is taken away, our other rights will tumble like dominoes. I think the following admonition to Christians summarizes the thought I’m trying to present today. Galatians 5:13 For you, brothers, were called to freedom. Only do not turn your freedom into an opportunity to gratify your flesh, but through love make it your habit to serve one another. Although this is written to Christians, think deeply about the principle it is presenting. We used to be a people of principle in the United States of America but principles are being tossed aside for gratification of our own individual desires. Those who think this ‘great’ nation can’t fall are deluded. Rome thought it was too ‘great’ to fall also. It fell. Babylon thought it was to mighty to fall. It fell. The way I view things now, from the political sphere down is that we are in a free fall that will only end in the loss of liberty for all. This is a letter to the U.S.
Reek of fire to this day. If you truly love freedom you will support the Religious Restoration Acts throughout our country, even if you are atheist, because you risk losing your own freedom in the process of robbing others of theirs. Be warned.